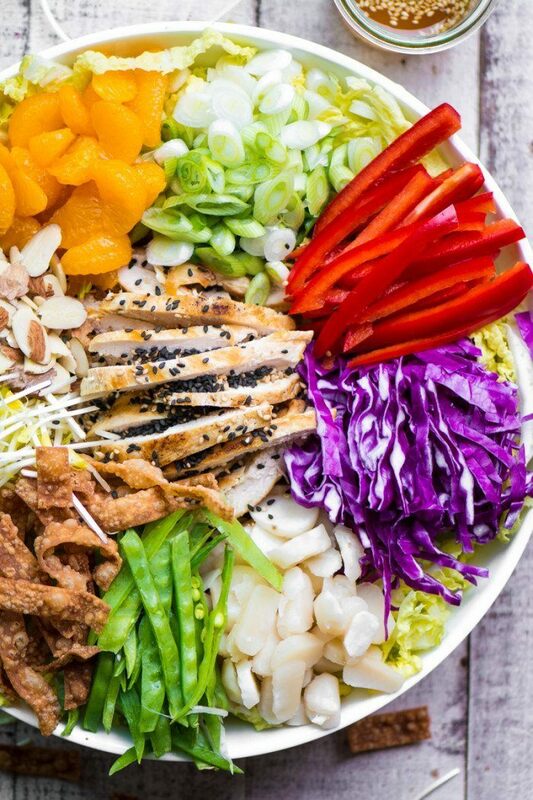 This Chinese Chicken Salad recipe is a healthy year round main course salad. It's colorful, satisfying, and insanely crunchy! To make the crispy wontons, slice the wonton wrappers into thin 1/4 inch slices. Heat 3 inches of oil in a small saucepan until hot. Drop a test wonton strip in the oil ~ it should fry to golden in about 30 seconds. Adjust the oil if it is too hot or too cool. Fry the wontons, in batches, stirring them around so they cook evenly. Drain on a paper towel. Shred the Napa cabbage and rinse well. Dry on a clean kitchen towel. Put the cabbage in a wide shallow salad bowl. Add some of the dressing to the salad and toss, using just enough dressing to lightly coat everything, you can always add more later.